Freed to Lead is a new, 10 week course, produced by Freedom In Christ Ministries. All leaders want to be the best they can be. But the truth is that you can read as many “how to” books as you like and still not be a truly effective leader. People don’t follow leaders who use the right techniques. They follow leaders who are authentic and real. Christian leaders have a huge advantage over others because they have become new creations in Christ. In the 10 sessions of Freed To Lead and the Steps To Freedom For Leaders, you will be surprised as you are helped to take the truths of this new identity much deeper, so that you can learn to lead as the new person in Christ that you are. 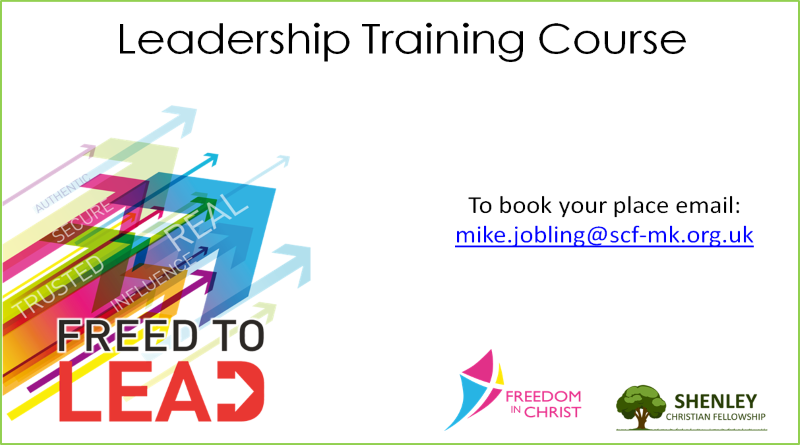 More details can be found at http://www.ficm.org.uk/freedtolead/whats-in-the-course. This course is for those already in a leadership position in whatever department at SCF, and for those who are exploring leadership and what it means to be a leader. Check back here for details of when we will next run this course.